The tarp has been a useful and money saving tool for all sorts of projects since their invention. 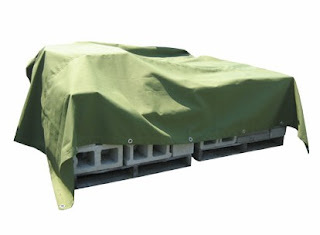 Tarps themselves are designed to protect anything and everything from the harsh elements. Around the home or when traveling the need for a handy and portable cover will pop up again and again. The canvas tarp building is starting to catch on as a wonderful light weight structure used to fill all sorts of needs. To extend the life of vehicles and perishables of all sorts requires keeping both the damaging rains and the harmful effects of the sun from beating down on our possessions. Ultraviolet protection is a must for any tarpaulin in order for it to be long lasting and effective. The thicker materials usually last longer and are measured by the denier scale. A hardy rip free material is a prime choice for building with. A simple wood structure can be both walled in and covered with a canvas tarp with little effort. Grommets are a common accessory and are handy when tacking down the larger ones to a structure. Cattle panels are a great flexible form to bend over and create an arch for covering and turning into an instant shed for any purpose. Colors of all kinds are also available. The most common colors for purchase are white, gray, and black, but all sorts of colors are available. Even camouflage versions are popular for hunting shelters that can be built on the spot and in just a blink. Color selection is often a matter of choice or availability, and thickness should take priority when making a shelter of any kind. There are a wide assortment of sizes and thicknesses of tarps. The most popular sizes for building use are twelve by twenty and ten by twenty. For larger projects a great workable size is the twenty by twenty size. A massive square that makes a great covering for just about anything. The material that the tarp is made up of is another factor when fighting the elements. Poly materials, canvas, and vinyl are often used. The debate as to what material is the best is still up in the air. A construction plan can be found online for any kind of canvas tarp building a person may need. Another quick search will help go find and purchase the supplies to do it yourself. In just a few days the gear will arrive and then a long lasting multipurpose structure can be up and ready for use in almost no time at all.